After several months of speculations, ESPN+ is finally here. We all know that this sports TV network is the most popular one in the US, with a highly loyal user base across the entire planet. Aside from a range of TV channels, ESPN has decided to make its presence known in today’s digital era. The new subscription service doesn’t only offer a lot of content but also works great as an important aspect of a whole ESPN package. Welcome to TechNadu’s ESPN+ review! First, let’s get to know this service by presenting you a set of the basic information. If you’re comparing this streaming service to other sports-related networks, the following information could come in handy. Next, we are going to show you the biggest pros and cons of using the latest ESPN’s streaming service. In case you don’t mind a few drawbacks, keep on reading our full review for more information. Highly polished UI; A rather large library of content; HD-quality streams; 5 streams allowed simultaneously. Cluttered search option; Unimpressive coverage of pro football and basketball; Not a replacement for cable TV. At the moment, ESPN+ seems like an interesting option but only if you’re not a fan of pro sports. Mainstreams sports are still reserved for specialized services and cable programs. So far, you have managed to get a clear idea of what to expect from ESPN+. Keep on reading to learn about different aspects of this streaming service. We know that you probably have a lot of questions. That is why we will begin with the very basic set of information, like on what devices you can use this service. 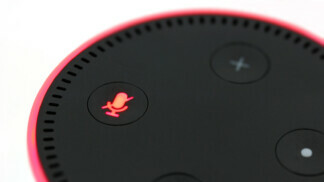 Then, we’ll guide you through the currently available content, the service’s pricing, and more. Before we continue, you need to know that ESPN+ is available in the United States only. In case you’re not located in this country, there are still ways to use this service. The best way to watch ESPN+ outside the USA is by using a VPN. Based on our tests, we strongly recommend using ExpressVPN which has proved to be the best option available. To use ESPN+, you need to install the ESPN app that has already been available for a while. Pretty much every popular platform is covered. Our Score: 10/10. Apple – iOS devices including iPhones and iPads, Apple TV and within the Apple TV app. Google – Android smartphones, Android TV, and Chromecast devices. Web – At any moment, you can use a Web browser to log in and stream the available content. This works on every device that connects to the Web and has a Web browser. As you can see, the chances are that your device is covered. There are several ways to sign up for ESPN+ and the entire process takes less than one minute. This applies to signing up via one of the available apps or through the Web version. Our Score: 10/10. Depending on your device, you can download the ESPN app on your iOS or Android device. Please note that if you already use this app, you will need to update it to gain access to the new service. Then, tap on the ‘Watch’ tab at the center of the menu on the bottom of the screen, and you’ll be greeted by the sign-up page. You can pay for the service using your payment (credit or debit) card or via PayPal. Early customers had a chance to use a 30-day free trial, however, you will most likely get to use the service 7 days free of charge. After this period, you will be charged. If you have several devices, you will need to link your ESPN+ subscription by going to the settings of the ESPN app and linking your new device. When it comes to the Web version, you should be able to use it simply by signing in. You can look at ESPN+ as an addon that lives inside your ESPN app. By activating it, you simply get access to new categories of content. This might be a bit confusing to some users, at least in the beginning. Our Score: 8/10. 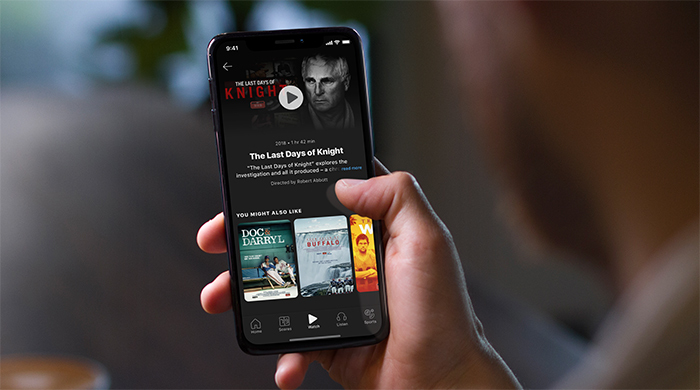 When it comes to media streaming services, they usually bring dedicated apps. You download the app, sign in, and you are welcomed by your library of streamable content. The same applies to ESPN+ but with few exceptions. 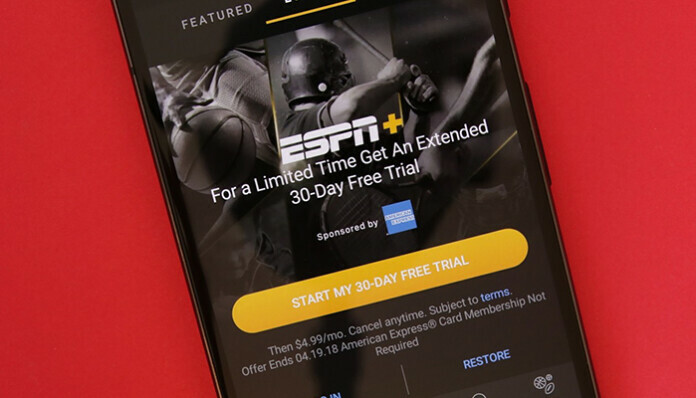 Instead of being a standalone app, it enhances your user experience by expanding the ESPN app. At the top of the page you can check out the latest scores from multiple sports, and then there’s a full ribbon dedicated to allowing you easy access to your favorite sports – whether that’s football, basketball, baseball, soccer, hockey, and so on. At the bottom of the screen, you will see tabs like Home, Scores, Watch, Listen, and Sports. 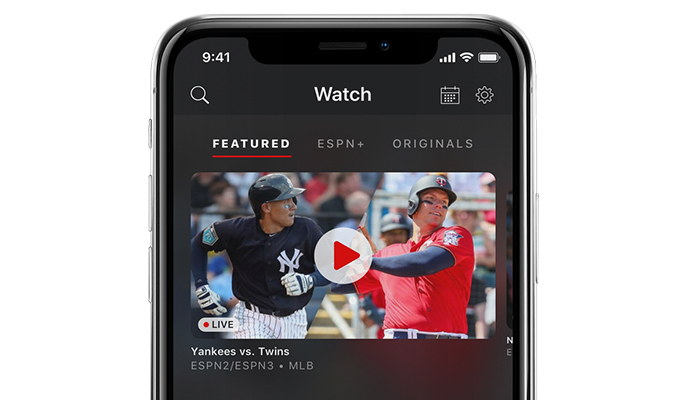 You access ESPN+ by tapping on the ‘Watch’ tab. This is where you’ll be greeted by different categories of content divided into different sports. As you enter overviews of certain titles, you will get to see more info and play those video files. You return to the previous screen by tapping the Back button (top-left corner). We also noticed that certain parts of ESPN+ can be found elsewhere in the ESPN app. When you tap on those files, you’ll be asked to join the streaming network in case you haven’t done that already. All in all, this is a very intuitive navigation once you learn the basics. Even though there’s plenty of content offered via ESPN+, you shouldn’t count on pro sports that require a separate subscription (like NFL and MLB, for example). Therefore, this service might not offer everything you want to watch. Our Score: 7/10. 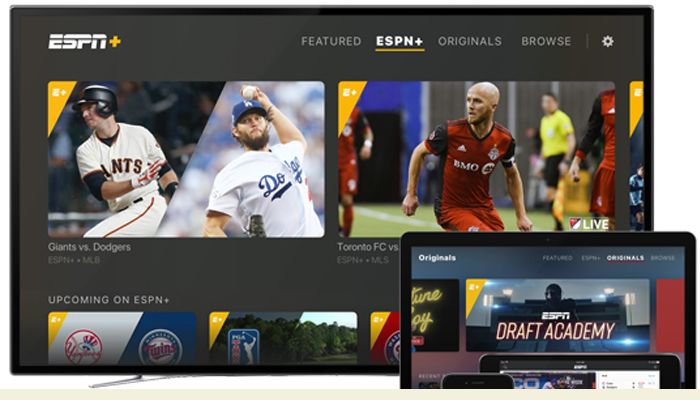 Just like with any other media streaming services, ESPN+ can only offer licensed content and original programming. Therefore, it’s hard to imagine this platform becoming the exclusive platform for watching live basketball, baseball, or football games. Still, this doesn’t mean that you won’t find plenty of interesting content here. Here’s what you can count on. MLB: Daily games are on offer during the regular season, seven days a week. This means that you’ll get to watch one new game per day. NHL: Just like the previous content category, a daily game will be offered during the 2018-19 season. This also includes on-demand replays of the 2018 Stanley Cup Playoffs. MLS: More than 250 games will be offered during the season, with a special treatment of Chicago Fire – bringing 23 Fire matches. College Sports: This is perhaps the most content-rich part of ESPN+. Almost every popular sport is covered, including football, basketball, baseball, wrestling, and more. PGA Tour Golf: You will get to watch live and on-demand all 50 days of coverage from 20 PGA tour events, including RBC Heritage, The Players Championship, and the Memorial Tournament. Grand Slam Tennis: Fans of tennis will get to enjoy watching matches from the US Open, Australian Open, Wimbledon, and more. Cricket: The currently available section for cricket is mainly focused on matches from New Zealand and Ireland. Rugby: Some of the covered tournaments are the SANZAAR Rugby, the HSBC World Rugby Seven series, and Major League Rugby. Canadian and English Football Leagues: If you’re a fan of Canadian and English football, you can count on up to 400 matches that can be live-streamed on watched on-demand. ESPN+ will stay on top of the latest matches as they happen. UEFA Nations League: The newly created tournament will be fully featured on ESPN+ with over 100 upcoming matches. United Soccer League: Finally, the entire United Soccer League of 2018 will be available on the media streaming service. 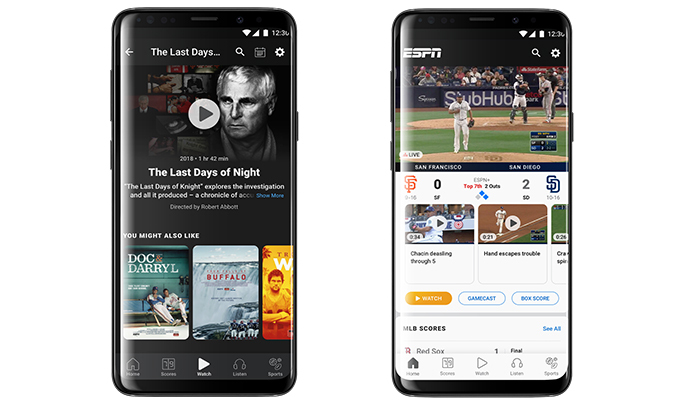 Aside from sports games and matches, ESPN+ allows its users to watch original programming and shows from numerous ESPN channels. This includes ’30 for 30’ documentary that is exclusively available here. Some of the other popular titles are Draft Academy and Quest for the Stanley Cup. You’ll also be able to check out the scores, read the news, listen to sports radio and podcasts, access the on-demand library, and check out various games and programming that’s not available on ESPN’s cable channels, such as the aforementioned FA Cup matches, for instance. Even though you’re paying for content here, you’ll still encounter some ads, but only a limited number of them and when you’re watching live programs. That’s not necessarily a tragedy, of course, but it is slightly disappointing since other platforms cut out the ads when you pay up. Hulu, for instance, gives users the chance to get a plan that also features ads for less money or one that’s ad-free. At the very least, there’s an option there. This is a very well-optimized service that works great every single time. This means streaming in full HD and up to 60 frames per second. However, some quirks are present. Our Score: 9/10. No matter the device you’re using, you will get to watch the available content in HD quality. Once you start to stream, you can pause it, rewind, and fast-forward by dragging on a timeline. It should be also noted that the app brings a picture-in-picture feature, allowing you to use other parts of the app and check the scores and news. When it comes to original programming, the app will remember where you stopped watching something. However, this won’t be the case if you decide to use a different device. Something like this is already present on Netflix and Hulu, so you’ll notice this feature missing. In case you have additional questions or doubts, the best way to get your answers is via a dedicated ESPN+ support page. There are other ways to get help as well. Our Score: 9/10. ESPN is a very large company and they already have a customer support system. After all, the company is offering a wide range of channels and other services, and you use those existing channels to get answers to your questions. The best place to start is the main support page for ESPN+. This is where you’ll find frequently asked questions divided into several categories. However, we don’t expect you to get into technical problems while using this service, where even the sign-up and cancellation procedures are very simple and clearly explained. Still, help is available right around the corner. If those questions don’t cover all your inquiries, you can always get in touch with the customer service department via email, phone call, or even chat. Live support, however, is only provided between 9 AM and 1 AM EST, all week long. If you have any issues in the meantime, you’re going to have to go with an email or to contact them via social media. 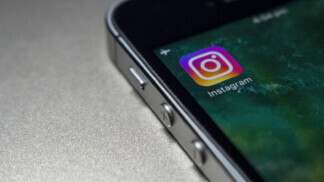 It’s a bit of an inconvenience, especially since other similar platforms offer around the clock support, but it’s not necessarily a deal-breaker. Two subscriptions models are available and both of these are quite affordable. You can pay monthly or annually. Our Score: 9.5/10. ESPN is, as mentioned before, free to use. ESPN+ brings loads of extra content to the table, including exclusive shows, new sports events, and more. For access to all this content, namely thousands of additional live events, on-demand content and shows, you’ll have to pay $4.99 per month. It’s either that or pay more upfront – $49.99 – but cover the full year and save $10 overall. It depends, of course, on whether or not you are willing to pay so much at once for a service you’re not sure you’re going to continue with for the full year. As with most similar platforms, you can also quit ESPN+ at any time, no strings attached. You also get a one-week free trial to enjoy all the perks while paying zilch so you can make up your mind if you want to give the platform a go. Since over 1 million people had signed up to ESPN+ back in September, we’re going to assume that a lot of them really like the platform. Plus, $4.99 per month isn’t really that much. Also, since we’re on the topic, you can watch on to five devices at once, so you can share with your family so you’ll each watch something else. This is great during peak season when there are so many matches to watch at the same time. ESPN+ isn’t made for every sports fan. Instead of being an ultra-powerful streaming solution that brings ESPN’s channels, it leaves you relying on cable. This feels like a missed opportunity because numerous cord-cutters lack quality sources of sports content. Today, ESPN+ is aimed towards those who simply want an additional source of sports – outside of professional leagues. PROS: Nicely designed UI; Live streaming and on-demand videos; Original programming included; Covers a variety of devices; Affordable. CONS: Pro sports are missing; The app doesn’t sync between different devices. If you’re a fan of ESPN as a whole, there’s really no reason not to go the extra mile and pay $5 per month, which is pretty much the price of a fancy coffee. We’d love to hear back from you so you can tell us what you like and dislike about ESPN+, so please drop us a note in the comments section below. Please share the article online so others can find too and follow TechNadu on our socials – Facebook and Twitter – for more tech news, guides, reviews, and interviews. 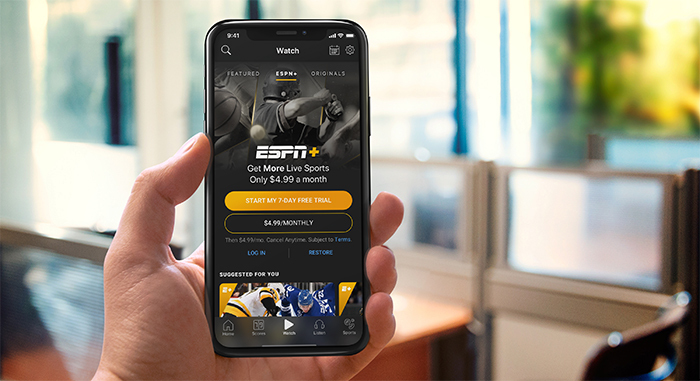 Even though ESPN+ looks enticing, this service is made for those who simply want an additional source of sports content. It can’t replace ESPN's cable TV channels, especially if you want to watch pro sports.